Karen is running late to work at a job site and can’t afford another strike on her record. She asks her coworker to clock in for her using her employee number and password. She arrives ten minutes late but her pay remains the same, with her employer none the wiser. This is called buddy punching and is just one of the top three ways employees commit time theft. A 2008 Nucleus Research report showed that 19% of employees admit to buddy punching. Ten minutes here and there doesn’t seem like much, but companies lose millions to time theft annually. So how can managers ensure that employees are clocking in and out when they’re supposed to? The challenge of multiple locations Inaccurate attendance tracking is common for mobile workforces. Due to the unique condition of their workplaces, timesheets may not be as accurate as they need to be. Notably, employees could be getting paid for hours they didn’t work. A 2015 study found that 43% of hourly employees surveyed admit to exaggerating their work hours. But without the right tools, there’s no way to prove otherwise. Even seemingly modern devices like fingerprint scanners are not reliable enough. They’re expensive, hard to repair, and don’t even work 100% of the time. And there are plenty of situations where they cannot be used. Employers whose staff work outside an office cannot be expected to make punch clocks and fingerprint scanners work. Construction workers, long-haul truck drivers, home care providers, and event organisers rarely report to the main office. Being off-site means employers need to rely on trust. They depend on the site manager’s or employee’s attendance reports. The accuracy of these records is questionable, regardless of the employee’s character or performance. Human error is far too common and businesses often pay for work that was not rendered. Read more: Time Theft: Top 3 ways employees steal time and how to stop it How can you be everywhere at once? When a business has multiple locations, a manager would like to be everywhere at once. Employees are only one of several moving parts that keep the business going. But they are also the biggest expense and most difficult to keep track of. Being everywhere at once used to be impossible. Now, with GPS-enabled technology, it’s not just possible; it’s already becoming the standard in every industry. Tanda, a leading time and attendance automation platform, lets managers supervise their mobile workforce from anywhere. It does this through the GPS Clock-in feature on the Employee Scheduling App. 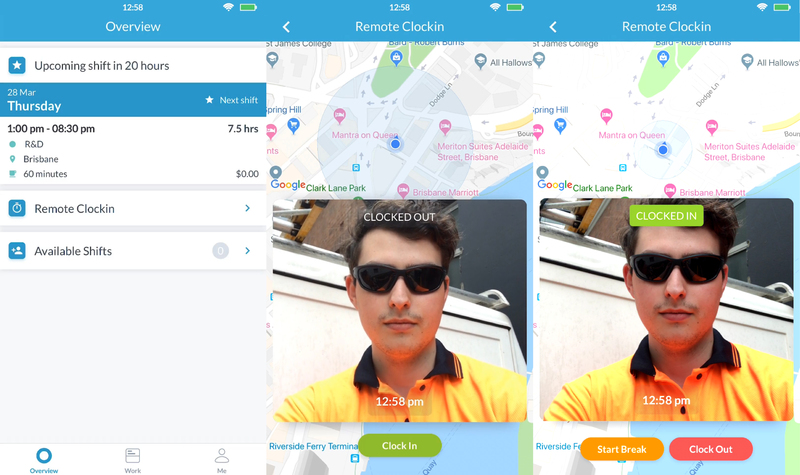 The Employee Scheduling App, which runs on iOS and Android devices, lets employees clock in and out from anywhere. Using it remotely will send the latitude, longitude, and employee’s photo to cloud-based timesheets. This is useful when they work at multiple sites or drive from location to location throughout the day. You can even monitor breaks through the mobile app. Access is no problem, as managers can use Tanda from desktop or mobile. You can verify every entry and ensure that there is no time theft, whether intentional or not. Read more: Facial Recognition vs Fingerprint Scanners for Time & Attendance Let automation do the work Time and attendance automation is indispensable to modern businesses. Keeping up with industry standards is no longer enough. Automation technology is one way to maintain an edge over the competition. Tanda helps businesses eliminate time theft and save millions of dollars in the process. Even businesses where traditional punch clocks and fingerprint scanners fail can revolutionize the way they monitor time. Mobile workforces will no longer be at risk of inaccurate timesheets because the GPS clock-in feature monitors it effortlessly. For construction, logistics, and home care industries, the GPS clock-in feature is a gamechanger. Managers are now able to oversee their employees and communicate any changes on one platform. Even rewarding performance is easier with attendance data to back it up. Employees too are assured that they are being paid exactly what they should be. Plus, they can check their shifts and file leave requests from wherever they are. Investing in software with a GPS clock-in feature empowers mobile workforces to perform at their best. And when they do, the business also grows with them. Karen is running late to work at a job site and can’t afford another strike on her record. She asks her coworker to clock in for her using her employee number and password. She arrives ten minutes late but her pay remains the same, with her employer none the wiser. This is called buddy punching and is just one of the top three ways employees commit time theft. A 2008 Nucleus Research report showed that 19% of employees admit to buddy punching. Ten minutes here and there doesn’t seem like much, but companies lose millions to time theft annually. So how can managers ensure that employees are clocking in and out when they’re supposed to? Inaccurate attendance tracking is common for mobile workforces. Due to the unique condition of their workplaces, timesheets may not be as accurate as they need to be. Notably, employees could be getting paid for hours they didn’t work. A 2015 study found that 43% of hourly employees surveyed admit to exaggerating their work hours. But without the right tools, there’s no way to prove otherwise. Even seemingly modern devices like fingerprint scanners are not reliable enough. They’re expensive, hard to repair, and don’t even work 100% of the time. And there are plenty of situations where they cannot be used. Employers whose staff work outside an office cannot be expected to make punch clocks and fingerprint scanners work. Construction workers, long-haul truck drivers, home care providers, and event organisers rarely report to the main office. Being off-site means employers need to rely on trust. They depend on the site manager’s or employee’s attendance reports. The accuracy of these records is questionable, regardless of the employee’s character or performance. Human error is far too common and businesses often pay for work that was not rendered. How can you be everywhere at once? When a business has multiple locations, a manager would like to be everywhere at once. Employees are only one of several moving parts that keep the business going. But they are also the biggest expense and most difficult to keep track of. Being everywhere at once used to be impossible. Now, with GPS-enabled technology, it’s not just possible; it’s already becoming the standard in every industry. Tanda, a leading time and attendance automation platform, lets managers supervise their mobile workforce from anywhere. It does this through the GPS Clock-in feature on the Employee Scheduling App. The Employee Scheduling App, which runs on iOS and Android devices, lets employees clock in and out from anywhere. Using it remotely will send the latitude, longitude, and employee’s photo to cloud-based timesheets. This is useful when they work at multiple sites or drive from location to location throughout the day. You can even monitor breaks through the mobile app. Access is no problem, as managers can use Tanda from desktop or mobile. You can verify every entry and ensure that there is no time theft, whether intentional or not. Time and attendance automation is indispensable to modern businesses. Keeping up with industry standards is no longer enough. Automation technology is one way to maintain an edge over the competition. Tanda helps businesses eliminate time theft and save millions of dollars in the process. Even businesses where traditional punch clocks and fingerprint scanners fail can revolutionize the way they monitor time. Mobile workforces will no longer be at risk of inaccurate timesheets because the GPS clock-in feature monitors it effortlessly. For construction, logistics, and home care industries, the GPS clock-in feature is a gamechanger. Managers are now able to oversee their employees and communicate any changes on one platform. Even rewarding performance is easier with attendance data to back it up. Employees too are assured that they are being paid exactly what they should be. Plus, they can check their shifts and file leave requests from wherever they are. Investing in software with a GPS clock-in feature empowers mobile workforces to perform at their best. And when they do, the business also grows with them.